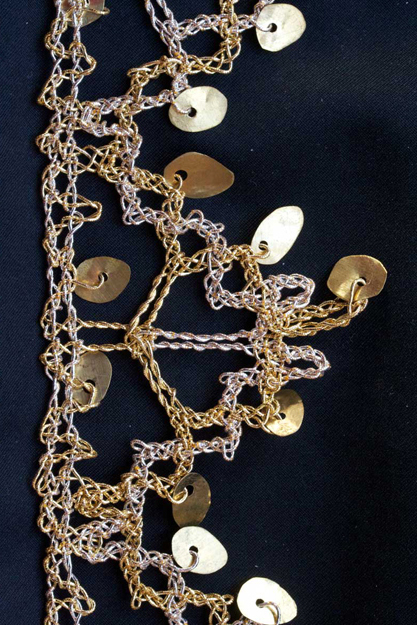 Norfolk Lacemakers took up the challenge to recreate a piece of 17C Gold & Silver lace. The original lace is on a Bearing Cloth housed at the Carrow House Study Center, Shire Hall, Norwich. The mission was to make a replica that could be used in Strangers Hall, Norwich, to aid the general publics understanding of the christening layette of an earlier age. The original Gold & Silver lace with gilt spangles (sequins) is sewn onto a crimson silk velvet. The Bearing cloth dates back to the 17C and is very fragile. Click on the above image to view a zoomable image. Images by kind permission of Norfolk Museums & Archaeology Service, Carrow House collection'. 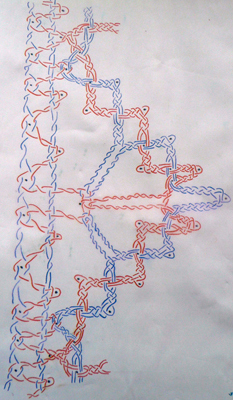 Above Images left to right: diagram of the redrawn lace, work in progress, finished lace.